Sunomono is Japanese cold noodle salad made with somen (buckwheat) noodles, served with rice vinegar dressing and topped with cooked cold shrimp, crab meat, daikon, shiitake mushrooms and cucumber. Very much a summer favorite. Bring 2 1/2 quarts water to a rolling boil in a 4-quart saucepan over moderately high heat. Add noodles and 1 cup more water. When water returns to a boil, add 1 cup cold water and bring back to a boil. Simmer noodles until just tender and slightly translucent, about 2 minutes. Test noodles for doneness by dipping 1 strand in cold water and sampling. If noodles are not tender, add 1 cup more water and return water to a boil. Drain noodles in a colander and rinse well under cold water. Return to saucepan filled with very cold water and rub noodles till all starch is removed. Drain again and keep noodles cold. Mix all ingredients and adjust to your taste. Sauce should taste sweet and sour. 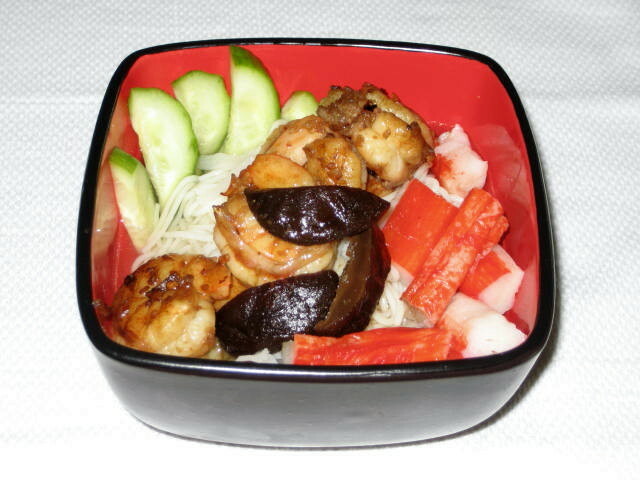 Place somen in chilled bowls, drizzle with 1/4 cup of dipping sauce and top with seafood and vegetables of your choice. For little bit of kick I add 1 tsp. of wasabi paste to my dipping sauce.